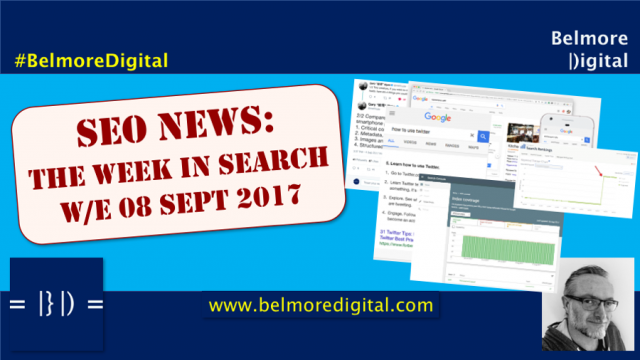 Wow, what an exciting bunch of stories for this week’s SEO News & Updates. 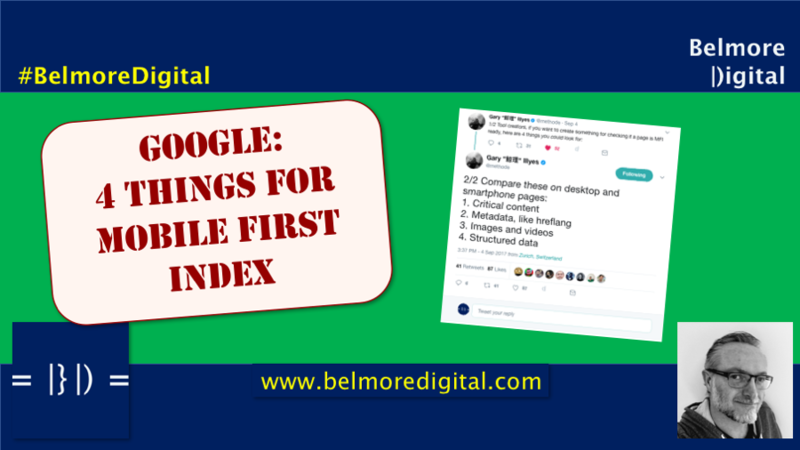 Google gave us the skinny on critical factors for the Mobile First Index. I was relieved to find that I could edit Google My Business listings directly in search. 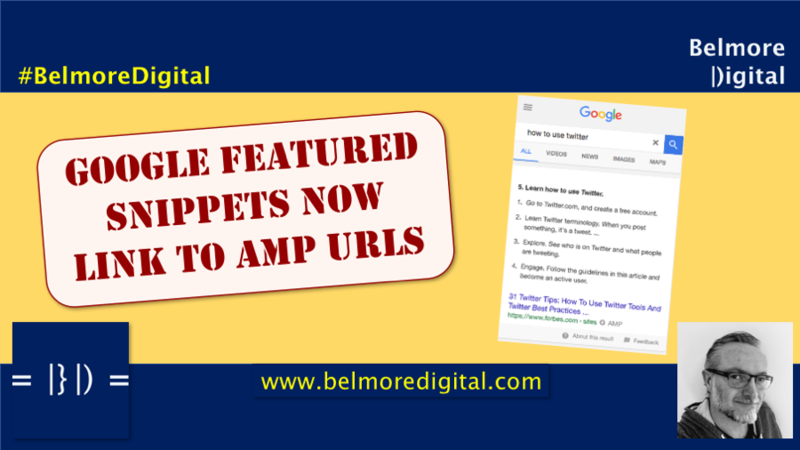 Google is now using AMP URLs for Featured Snippets. The Google Search Console Beta program expanded – were you included? 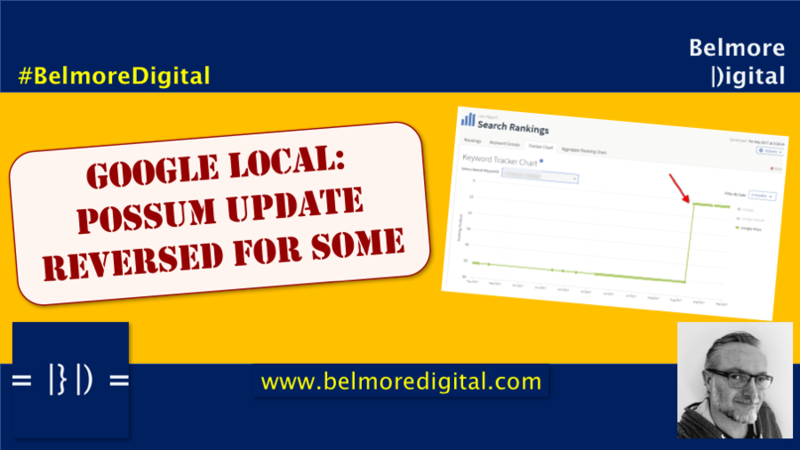 Google Local rolled back its Possum Update at the end of August. To the releif of some local business owners. 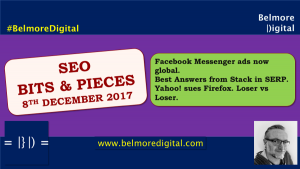 The SEO Bits and Pieces really delivered with a a couple of cracking nuggets on social media and links. Good reading if you ask me! 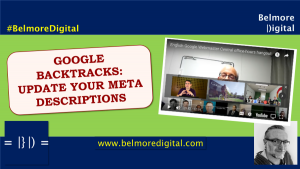 He listed four areas to focus these comparisons on: critical content, metadata, images and videos, structured data. He would also have included links, but apparently that’s too complicated for SEOs. Hmmm. 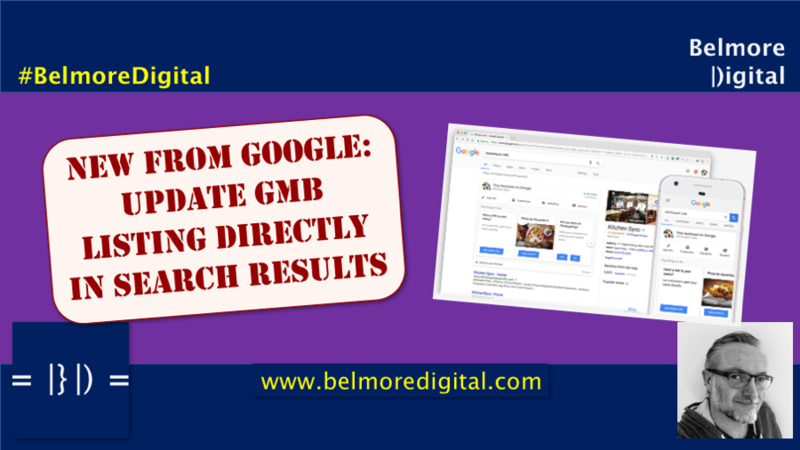 You should make sure you have an accurate and up=to-date Google My Business listing regularly, especially if changes are crowd-sourced..
We all know there is a new version of Google Search Console on the way, especially if you took notice of my two stories: New Google Search Console Layout Coming and Google Reveals Two Secret Google Search Console Features. Well, Google has rolled out access to a slightly wider group of beta testers. These beta testers have been excitedly posting screengrabs of new reports. The big new report really seems to be the Index Coverage report. Check your email (the one you have verified with Google Search Console) to see if you have access to the beta search console. Log in, have a look around, tweet a few pics. Make sure you feedback to Google your thoughts on the new Search Console. 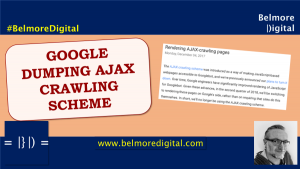 Bearing in mind the rate of development for Google Search Console, if you miss the opportunity to raise some long-dreamed of feature now, you will find it’s another five years before it’s implemented. Make sure you check out the Index Coverage report. It looks smashing, but may flatter to deceive. 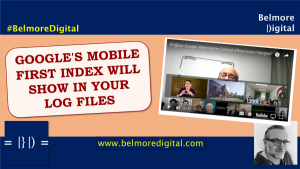 Click here to contact me to discuss using Google Search Console data to improve your SEO. Google is going for it with the Beta Search Console. 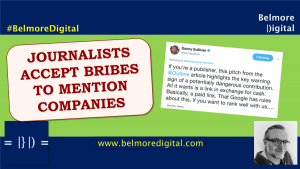 I have a few question marks over whether this is designed to win over the webmaster community before release, or whether it is seeking genuine feedback. The index coverage report looks great. I really hope it lives up to expectation, but like a lot of things, I feel the report is likely to give you 50%-60% of the information you need and frustratingly leave the rest out. 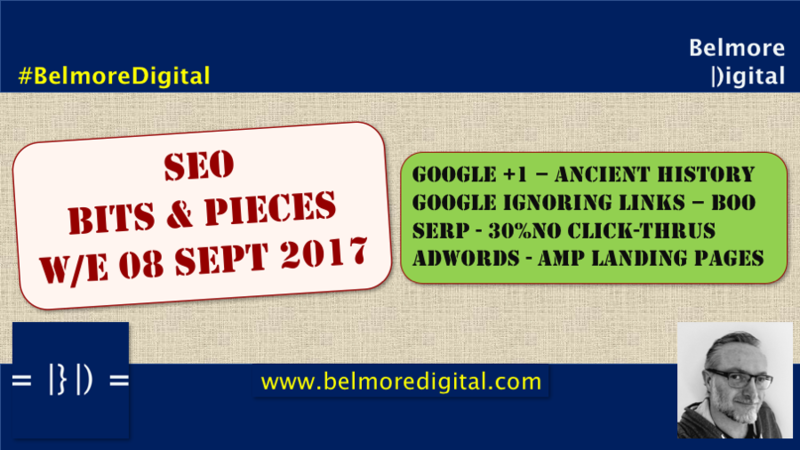 Still, when it comes to Google, SEO and surfacing in the rankings, the more information from Google, the better, frankly. 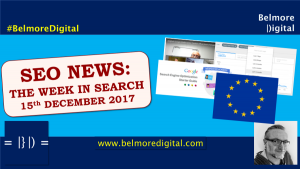 Joy Hawkins reported discovering that the Google Local Possum update from August 2016 had been rolled back around 22nd August 2017. The Possum update filtered businesses which shared, or appeared to share multiple businesses out of a single location / entity. EG those from virtual office suites. As with all updates, there was plenty of collateral damage, which appears to have been reversed in a number of instances. Check your Google Local 3-pack / 5-pack rankings if you were filtered by the Possum update. If you were, and you are back, cheer from the rooftops. Clearly disambiguate yourself from the item which is causing you to be filtered: address, phone number, or business name. Submit the changes and wait for the Google Local team to update. It may be some while. Click here to contact me to discuss getting your business listed in Google Local. Google has issues with similarity and duplication. 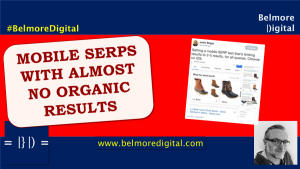 We know that from the main organic search results. 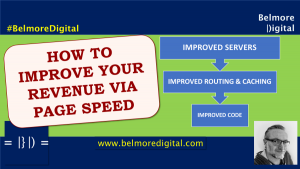 Unfortunately addresses, phone numbers, locations are (or can be) a little harder to deduplicate and disambiguate for the Local team, and there are plenty of businesses out there who are busy taking advantage of Google by claiming virtual offices as staffed offices, or opening hours that don’t exist, or keywords in the business name – all sorts of things. 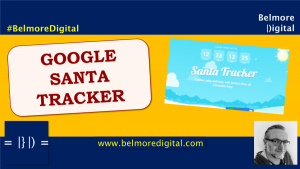 Usually a rollback of a filter from Google means that it has developed some new technique or technology which allows it much finer granularity on things it should / shouldn’t filter. A while ago, Google issued a reminder re virtual offices, and there is a reasonable chance that was a business’s chance to get itself cleaned up before this change came into effect. There is also a chance is was a standard Google mumbling about playing by the rules. Well. There was a tremendous stink this week, when a one-time Forbes reporter (they apparently have them) claimed that Google reps had specifically told them in 2011 that adding Google’s +1s to their pages would increase their rankings. Not likely. More likely: non-tech reporter and sales people get slightly confused and add 2+2 to make 15. Correlation and causation strike again. Google ignore tones of links, but it’s impossible for mere mortal webmasters and SEOs to figure out which ones we do. Apparently only people who’ve worked on Search Quality might have a chance. (He may be right about knowing exactly, but it still doesn’t mean others aren’t in the right area). So says Gary Illyes on Twitter. Up to 30% of Google’s results don’t get clicked on. There we have it. Nearly 1 in 3 searches result in no click. Either the information fulfils the query, as in Featured Snippets, business phone numbers and the like, or the results are just not what the user wanted, or they remembered their toast was on fire. The other reason is all the scrapers querying which don’t generate a click either. Google Adwords is now rolling out AMP Landing Pages to all Adwords users, as we discussed at the end of May, or thereabouts. Hooray! Quick Ads. 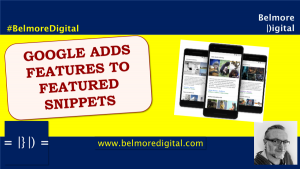 Click here to contact me to discuss any of these SEO Bits and Pieces and what they could mean for your business further. You can now edit your Google My Business listing directly in search. Google Featured Snippets have started to link to AMP URLs, but no boost for rankings, yet. 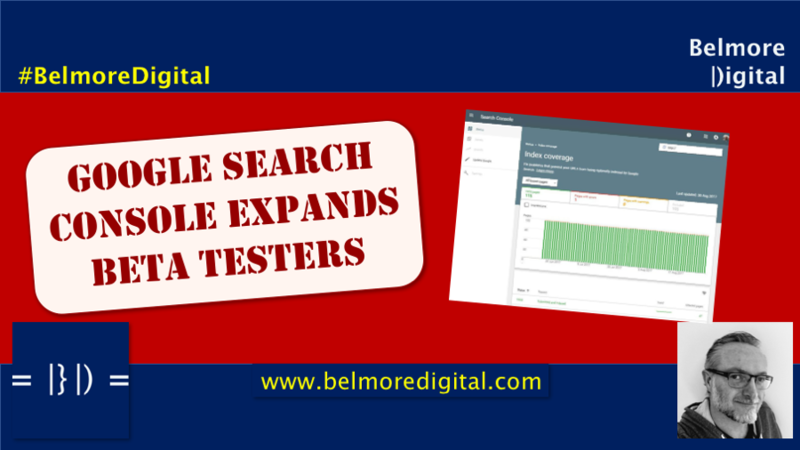 Google Search Console is widening the net of beta testers for its upcoming update. The Google Local Possum update has been rolled back for some who were possibly caught up in it unreasonably. Maybe.